New installation of Shaker in frame section and island. 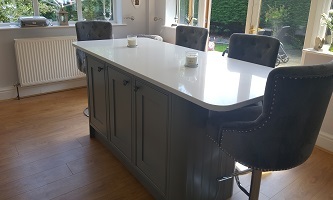 All bespoke units with Shaker doors fitted with curves and tongue and groove panels. 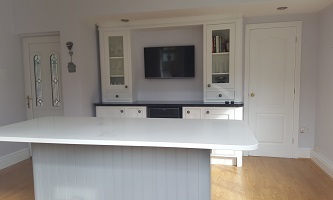 Bespoke cornice to match existing kitchen. Total respray to match Wevet Farrow and Ball and Plummett finished in Satin lacquer. New 30 mm Granite worktops. 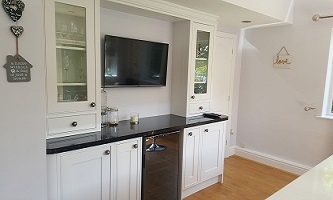 New Flat screen TV fitted to wall and electrical USB points installed on the island.